Welcome to the International Kojosho Karate Federation official site. Offensive and defensive theories of motion, taken from the Eighteen Postures, were used to construct Forms that are designed to be worked by two and three people simultaneously. These Two-Person and Three-Person Forms incorporate the combative and self defense applications unique to the Kojosho System. They discuss the elements of rhythm, timing, and distance that are essential to achieve effective technique. They also demonstrate the necessity for the combative attitudes of motivation, strategy, and commitment, which must precede technique. 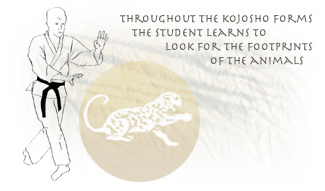 The Forms are the basic textbooks of the Kojosho System. They demonstrate to all students who study them the sequence of threat and reaction and the necessity for physical, mental, and spiritual discipline. As advanced, black belt students continue to study, they are gradually introduced to the concept of the Third Person, a series of Forms that work between the Two-Person Forms, defending against an attacker while simultaneously attacking a defender. Tora, the Tiger, and Tsuru, the Crane, make up the first two-person set, and they incorporate the essential principles of attack and defense. To teach beginning students how to hit hard and to penetrate, the Tiger teaches students to attack with courage and determination and allows students to take on the emotional qualities of the Tiger. Conversely, in order to teach beginning students to defend effectively, the Crane teaches students to respond with discipline and precision, encouraging students to take on the emotional qualities of the Crane. Together, the Tiger and the Crane are an expression of offense and defense and the pulsating nature of the sphere of combat. What is initially aggressive must later yield, and what starts out defensively must ultimately counter. Students must learn to attack totally and defend completely and must allow their energy to flow unimpeded between the opposite poles of aggression and defense. Kyü Senjutsu, the Nine Maneuvers and, Kakure Yöso, the Hidden Element, are the more modern names for the Snake (Hebi) and the Hawk (Taka), the second two-person set. While the first two-person set discusses the single technique, the Nine Maneuvers and the Hidden Element teach combination effectiveness and how to attack and defend while using multiple techniques. The Nine Maneuvers teach the attributes and emotional qualities of the Snake, which uses deadly strikes, circular as well as linear motion, and continuation of technique to win. The Snake knows how to coil to store up energy and when to release that pent-up energy in a strike. Conversely, the Hidden Element demonstrates the characteristics of the Hawk, which flies elusively and attacks suddenly, absorbing blows and counterattacking. The Hawk knows how to overcome the instability of flight and offset the initial size disadvantage with the superiority of speed. Together, the Nine Maneuvers and the Hidden Element are an expression of the effectiveness of multiple attacks and the necessity to defend with light, speedy movements, redirecting instead of opposing the attacks. These forms equip students to deal with the sophisticated opponent. Chöyö No Kata, The Positive Long Form and Chöin No Kata, the Negative Long Form, are the more modern names for the Dragon (Ryu) and Deer (Shika), the third two-person set. They introduce the principles of continuous motion, action, and reaction in a circular flow. The Positive Long Form is a song of the Dragon. The Dragon incorporates the Tiger, Crane, Snake, and Hawk and is the complete warrior, favoring no particular weapon, yet utilizing all things as weapons. The Positive Long Form presents the emotional attributes of the Dragon. The Form trains students to fight like the Dragon, valiant and shrewd, smothering the opponents under a continuous barrage of circular techniques. The Negative Long Form presents a smooth impenetrable defense. Using the alertness, awareness, and swiftness of the Deer, this Form teaches students to tempt the opponent into overreaching and then to counterattack the overextended opponent at odd angles, not opposing force with force, but intersecting outside the opponent's power curve. Together, the Positive and Negative Long Form examine the strengths and weakness of circular motion; and from the study of these Forms, students learn to find and exploit the flaws in the technical structure of the superior opponent. The concept of the Third Person interposes the Leopard (Hyo) between the Tiger and the Crane, the Monkey (Saru) between the Snake and the Hawk, and the Bear (Kuma) between the Dragon and the Deer. The Third Person must attack one while simultaneously blocking the other. Because the student's two eyes are limited in what they can physically see, the Third Person must develop the third eye of perception and intuition. Although understanding of both attacker and defender makes the task easier, still the Third Person must be able to feel the actions of the opponents with a sixth sense; and this ability allows the student to move in harmony and safety between them both. The concept of the Third Person develops the sensitivity to look with the inner eye and prepares students to face the ultimate opponent. Tiger and Crane, Tora and Tsuru, when done joint set (Futari No Kata) are called Kokaku. Snake and Hawk, Hebi and Taka, are called Jayo. Dragon and Deer, Ryu and Shika, are called Ryuroku. When Leopard is used to create a third person scenario, it becomes a Sannin No Kata and named Kokakuhyo. When Monkey is used the Sannin No Kata is called Jayoen. When Bear is used the Sannin No Kata is called Ryurokuyu. The Kojosho Forms are also performed with weapons at the advanced level. The One-Person, Two-Person and even Three-Person forms all have a weapons training component.